From “Duwvaart”, the 1980 book on push navigation by Dutch authors Jansen and Van Heck! Featuring today: ‘Vereniging van sleep- en duwbooteigenaren “Rijn en IJssel” ‘ (“Union of tugboat and pushboat owners Rhine and IJssel”), based at Rotterdam. Rhine and IJssel, of course, are very important rivers to the Dutch. Founded at Arnhem 1927 as an interest group reacting to diminutive profits and adverse circumstances e.g. many shipping agents also held pubs which did not help matters if you wanted to get shipments in an honest way. First mostly interested in towage and social affairs, extended to tariffs and infrastructure in the ‘fifties. In the ‘sixties, due to a shift of interest towards push navigation, adoption of the current name which replaced ‘Maatschappij tot exploitatie van vaartuigen Rijn & IJssel’ (“Company for the exploitation of vessels Rhine and IJssel). Counselling on social and legal matters, subsidies, tariffs, procurement, etc. At time of writing about 70 vessels represented, 40 of them pushboats. Not illustrated, but described, is a triangular pennant blue/red with initials ‘R&IJ’ in white. This was the house flag of the first union, ‘Vereniging van Sleepbooteigenaren’ (“Union of tugboat owners”). Shown as a b/w drawing, the rectangular house flag of ‘Vereniging van Sleep- en duwbooteigenaren’ is described as being white with a red diamond, blue waves alongside (white within diamond) and initials ‘R&IJ’ in white. This site is not very informative as you have to be a member to access most of it. Luckily the flag is flown on the ‘Isis’ (photo on Vlootschouw and logo about halfway page). Still according to the site, the office is now established at Dordrecht. The logo again, on a webpage of the association: White, unusually designed initials ‘R & IJ’ (above each other) on a red square diamond, two stylized blue waves touching left and right corner of diamond, and turning white where they invade said diamond somewhat. As a matter of detail, the waves are cut off straight outside the diamond but inside, along ascending diagonals! The Dutch auction site ‘Marktplaats’ features the current flag at the moment: offer no. 185109811 put up by “Skipvlag”, accessed 6 Aug 2008, dimensions given as 0.50 [m] x 0.75 [m]. By the way, these are the national colours. 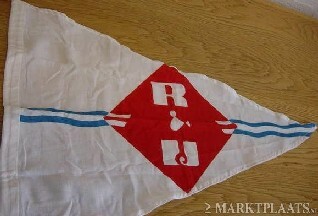 As announced on 11 Aug 2008, the current Rijn & IJssel pennant based, of course, on the rectangular version. In this case the diamond almost touches the edges. Source: Dutch auction site Marktplaats, offer no. 180970127 (accessed 13 Jul 2008) put up by “Skipvlag”. Dimensions given as 0.45 [m] x 0.65 [m].